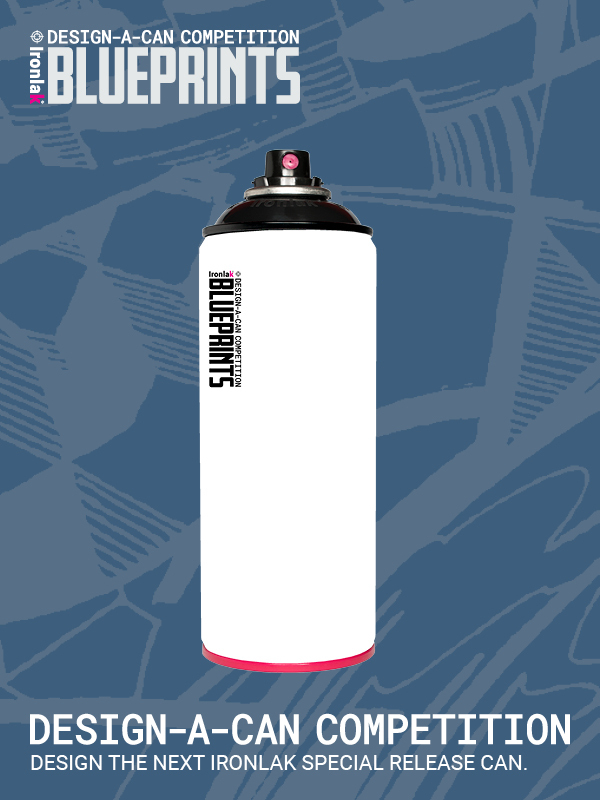 Design the artwork for The Ironlak Blueprints Design-a-can competition - If you win, Ironlak will put your design on an Ironlak 400ml Gloss Acrylic spray can with the colour of your choice into full production in Q2 2019 + you will get 240 x FREE cans! 3 x CHANCES TO WIN! Competition closes 23:59 Monday 31 December 2018. Winners will be announced between 00:00 Friday 4 of January and 23:59 Monday 7 January 2019 Australian Eastern Standard Time with winners notified by Instagram private message. paragraphs (a) and (b) above. 3.1 Entries must be submitted by posting to Instagram using an account with public display with the accompanying hashtag #ironlakblueprints by the closing date specified in paragraph 4.1 of these terms and conditions. 3.4 Neither the Promoter nor any of its employees, agents or representatives will be responsible for the non-receipt and/or non-inclusion of entries in the competition as a result of being lost, late, illegible, incomplete, invalid, or because of technical failures or otherwise, including such failure which is within the control of the Promoter or its employees, agents or representatives. 3.6 The winners will be required to confirm in writing that they have read, understood, and complied with the terms and conditions of this prize draw, and may be required to provide proof of eligibility (including, but not limited to, proof of identity, proof of age and/or proof of residency), as necessary. The proof of eligibility that will be considered suitable for verification is at the Promoter’s discretion. 4.1 Three winners will be selected from all eligible entries received by the closing date on Monday 31 December 2018 at 23:59. 4.2 The competition entries will be judged by a panel of at least three judges. The decision of the panel of judges (acting reasonably) will be final. 4.5 The winner must be available to meet by video chat with the Promoter’s representatives once notified and to supply final approved files by Thursday 31 January 2019 (or such later date as the Promoter may specify for this purpose). 4.6 The Promoter will send the full names of the judges by e-mail to anyone who writes to the Promoter requesting such information within one month of the closing date referred to in paragraph 4.1 of these terms and conditions. 240 x Limited Edition Ironlak 400ml Gloss Acrylic Spray Paint cans featuring your own design and selected colour - value of $2,400.00 AUD (inclusive of GST). 5.2 The prize will be as stated in paragraph 5.1 above and is non-transferable and nonrefundable. No cash or other alternative is available. The prize may not be claimed by a third party on your behalf. The Promoter does not accept any responsibility if you are unable to take up the prize. 6.1 The Promoter will endeavour to notify the winner on or around Monday 7 January 2019. If the winner does not respond to our notification prior to Friday 11 January 2019 (or such later date as the Promoter specifies for this purpose), the Promoter reserves the right to withdraw prize entitlement and the prize will be forfeited and an alternative winner will be selected. Upon prize forfeiture, no compensation will be given. conditions and/or the competition will be subject to the jurisdiction of the Australian Courts. 7.8 The delivery date of the prize will be determined based on the practical insertion of the requested colour to AVT Paints Pty Ltd production schedule. Target production date is prior to the completion of Q2 2019. (b) waive all moral rights, in and to your competition entry and otherwise arising in connection with your entry to which you are or at any time in the future may be entitled under the the Australian Copyright Act 1968 and Designs Act 2003 as amended from time to time and under all similar legislation from time to time in force anywhere in the world. the Promoter may reasonably request in order to ensure that the Promoter receives the full benefit of the assignation set out in paragraph 8.1 of these terms and conditions.